ab113435 is expected to recognize all four reported isoforms (NP_000546.2; NP_835365.1; NP_835364.1; NP_001182482.1). Reported variants represent identical protein: NP_835364.1 and NP_835366.1. , corresponding to internal sequence amino acids 151-161 of Human Doublecortin (NP_835365.1; NP_835364.1; NP_001182482.1. ), or amino acids 232-242 of Human Doublecortin (NP_000546.2). Our Abpromise guarantee covers the use of ab113435 in the following tested applications. WB Use a concentration of 0.01 - 0.03 µg/ml. Detects a band of approximately 45 kDa (predicted molecular weight: 49 kDa). IHC-P Use a concentration of 2 - 4 µg/ml. Immunohistochemistry (Formalin/PFA-fixed paraffin-embedded sections) analysis of human cerebellum labeling Doublecortin with ab113435 at 2µg/ml. Microwaved antigen retrieval with citrate buffer pH 6, HRP-staining. Publishing research using ab113435? Please let us know so that we can cite the reference in this datasheet. Vielen Dank für Ihre Auskunft. Ich suche einen Antikörper der spezifisch Neurone (Spezies Maus) anfärbt und diese deutlich von Gliazellen abgrenzt. Wir arbeiten mit Zellkulturen also ICC. Der Antikörper sollte aus der Spezies goat sein, da wir ihn mit einem mouse und einem rabbit Antikörper kombinieren wollen. Vielen Dank für Ihre Hilfe. Vielen Dank für Ihre Antwort. Ich habe Ihnen einen Anti-Doublecortin Antikoerper aus der Ziege herausgesucht. Click here (or use the following: https://www.abcam.com/index.html?datasheet=113435). Doublecortin färbt keine Glia -Zellen an (siehe Paper im Anhang). Allerdings wird es am stärksten im Neonatalen Gehirn expremiert. Wenn die Zellen aus einem alteren Tier stammen, kann das Signal dementsprechend schwächer sein. Unseres Wissens nach wurde der ab113435 bisher noch nicht in ICC getestet. Falls Sie dies selbst testen möchten, kann ich Ihnen zur Zeit ein spezielles Angebot über einen 100%igen Abreview-Rabatt anbieten. Bei diesem Angebot bekommen Sie einen Rabatt für eine zukünftige Bestellung, wenn Sie uns ein Abreview mit dem Testresultat zusenden. Der Rabatt würde den ganzen Wert von ab113435 abdecken, und gegen eine erneute Bestellung eines weiteren primären Antikörpers von uns verrechnet werden. Um von diesem Angebot profitieren zu können, folgen Sie bitte diesen Schritten: 1.) Bestätigen Sie mir bitte, dass Sie ab113435 in ICC testen möchten. 2.) Bitte bestellen Sie erst nach Erhalt des Rabattcodes. 3.) Bestellen Sie den Antikörper wie üblich per Telefon, Email oder Fax 4.) Testen Sie den Antikörper in ICC. 5.) Teilen Sie uns das Ergebnis Ihres Tests durch ein Abreview mit und notieren Sie den Discount Code in dem Feld "additional notes" Unter der folgenden URL können Sie mehr über unser Abreview System erfahren: https://www.abcam.com/abreviews 6.) Der Rabattcode ist nach dem Abschicken des Abreviews aktiv, und Sie können einen anderen primären Antikörper zu dem gleichen Preis wie ab113435bei uns bestellen (halten Sie bei der Bestellung bitte den Rabattcode und die Bestellnummer von ab113435 bereit). Bitte beachten Sie, dass der Rabattcode innerhalb von 4 Monaten nach Ausstellung eingelöst werden muss. Der Rabattcode wird gültig unabhängig davon, ob Ihr Ergebnis positiv oder negativ ist. Die Bedingungen zu unserem 100% Abreview Rabatt können Sie unter dem folgenden Link nachlesen: https://www.abcam.com/collaborationdiscount Ich hoffe, diese Informationen helfen Ihnen weiter. Falls Sie einen Rabattcode erhalten möchten oder weitere Fragen haben, zögern Sie bitte nicht, sich wieder an mich zu wenden. Here are the answers to your IHC questionnaire about the double-cortin antibody. Any advice would be much appreciated. It will take approximately 5 minutes to complete the questionnaire. Antibody used for immunohistochemistry, but only non-specific staining seen. What steps have you altered to try and optimize the use of this antibody? I have altered the antibody concentrations, blocking and buffer solutions. Thank you for getting back to me with those details. As I have mentioned previously, we have not performed any IHC experiments with this antibody, we would therefore not be sure of how well it would perform in this application. You mentioned on the phone that one of your colleagues had used a Doublecortin antibody for IHC. Were you able to confirm that it was ab113435? Having reviewed the protocol you have been using there are a few suggestions I can make which may help to improve the results obtained. Yamashita S, Okada Y. Application of heat induced antigen retrieval to aldehyde fixed fresh frozen sections. J. Histochem Cytochem. 2005 Nov;53(11):1421-32. 2. I would suggest performing a "no primary" control alongside with the normal staining to see if the secondary antibody is contributing to the non-specific binding. It may also be worthwhile to reduce the concentration of secondary antibody. 3. I would reduce the concentration of hydrogen peroxide used to block the endogenous peroxidases to 0.3 % and it may be worthwhile to perform this block following the incubation of the primary antibody to reduce any potential damage to the epitope. I hope these suggestions help to understand where the problems may be coming from. Have you tried using the antibody in Western blotting (an application which the anitbody has been used with before). What were the results of this? I hope this information has been of help. I look forward to recieving your reply. Phone call requesting infromation of how anti-Doublecortin antibody (ab113435) can be used in IHC of paraffin embedded sections. Thank you for contacting us and reporting the difficulty you have found in using the anti-Doublecortin antibody (ab113435) in IHC. As discussed over the phone, we have not ourselves tested this antibody in IHC and have had no reports of our customers having tried it either. It may therefore be that the antibody is not suitable for this application. However, I would be happy to try to advise you as to how the protocol may be optimised in order to obtain the best results. For this reason, I have attached the questionnaire we discussed over the phone to this email. If you have managed to find out if the antibody your colleagues were using to stain Doublecortin was ab113435 that would be very interesting to know. And if you are able to share with me the lot number they used I can have a look into this as well. 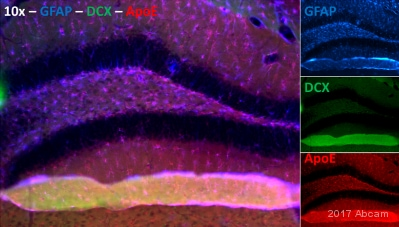 We would be very interested in trying this Ab on brain sections and it is more convenient to use a goat antibody like ab113435 (is the ab18725 rabbit?). Please let me know of the details of the testing discount you offer. However, as it is understandable that we want to make sure that this antibody works for us and I suppose that it can be useful to you to get feedback on the performance of this Ab on brain sections (Fluoresence), would you consider sending us a small amount of the Ab to test on our system? In such case, we would be happy to pay shipping expenses. Thank you very much for your interest in ab113435. We do not supply samples of our antibodies and so therefore I am unable to send you an aliquot to try out and you are correct that ab18723 is a rabbit polyclonal antibody. As ab113435 has not been tested in IHC-P. Therefore, I can offer a discount off a future purchase if you buy ab113435 now, test it in IHC-P and submit feedback to us in the form of an Abreview. It doesn’t matter whether the Abreview is positive or negative, we would just really like to receive your feedback. The discount would be to the value of 1 free PRIMARY ANTIBODY. 1. Reply to this e-mail to let me know that you would like to proceed and test ab113435 in IHC-P. I will then send a discount code. This code must be issued before purchasing ab113435 so please wait for my reply before ordering. 2. Purchase ab113435 either by phone, fax, or online (www.abcam.com). 3. Test it in IHC-P.
We are always pleased to obtain feedback about our products and any information is greatly appreciated! Even if ab113435 turns out to be unsuitable for IHC-P you will still receive the discount on your next purchase after your Abreview has been submitted. Your site provides WB data, could you supply me with references/data that show how this antibody works on brain sections (we use cryosections PFA perfused and post-fixed with PFA)? I would recommend that you also look at ab18725, as this antibody has been shown to work in various IHC methods and in multiply species. Please let me know if you would like to take advantage of our testing discount program or if there is anything else I can help you with.